Mix and match any top and bottom beauty case to customize your organizational needs! 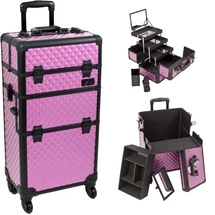 Interchangeable makeup cases are individually self-contained tops and rolling bases that connect together for the best professional makeup case for your needs. 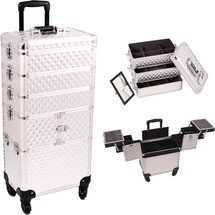 You can customize your makeup artist travel case by adding on tops to make one big case or use separately if you're looking for a smaller case. Choose a pro makeup case with a fashionable finish to suit your style. Our interchangeable series provides some of the best makeup cases for makeup artists available on the market.